Releasing the Magic! : The Ontario Skills Passport! The Ontario Skills Passport was developed after conversations with employers and identifies the essential skills that enable people to perform tasks required by their occupation and other activities in their daily life. Importantly, these skills provide people with a foundation for learning other skills, and enhance their ability to adapt to change. 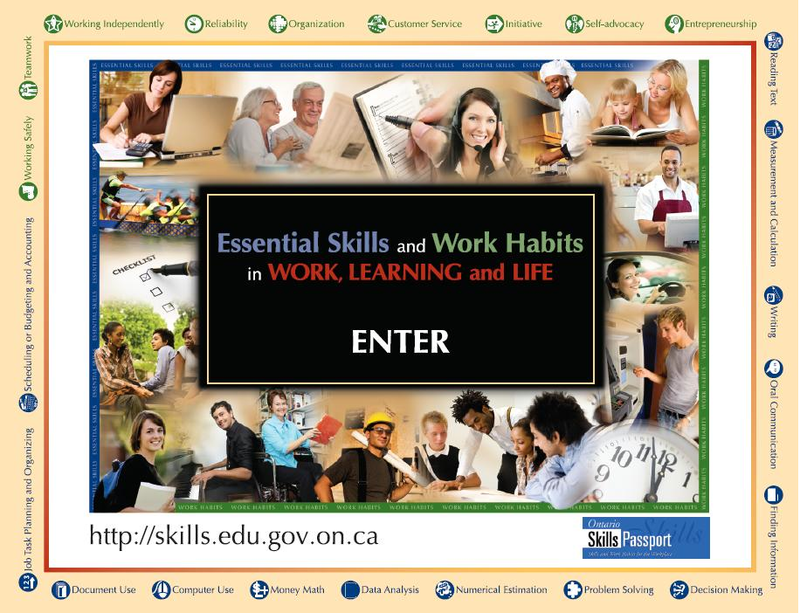 The Ontario Skills Passport identifies the essential skills and work habits needed for work, learning and life. 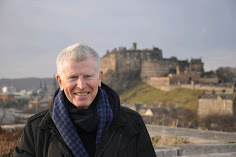 Reading Text: The comprehension of text consisting of sentences and paragraphs. Writing: The preparation of written materials for a variety of purposes. Document Use: The use of labels, lists, signs, graphs, charts, tables, forms, and other similar materials. Computer Use: The use of any type of computerized technology. Oral Communication: The use of speech for a variety of purposes. Money Math: The use of mathematical skills in making financial transactions, such as handling cash, preparing bills, and making payments. Scheduling or Budgeting and Accounting: Planning for the best use of time and money, as well as monitoring of the use of time and money. Measurement and Calculation: The measurement and calculation of quantities, areas, volumes, and/or distances. Data Analysis: The collection and analysis of data in numerical form. Numerical Estimation: The production of estimates in numerical terms. 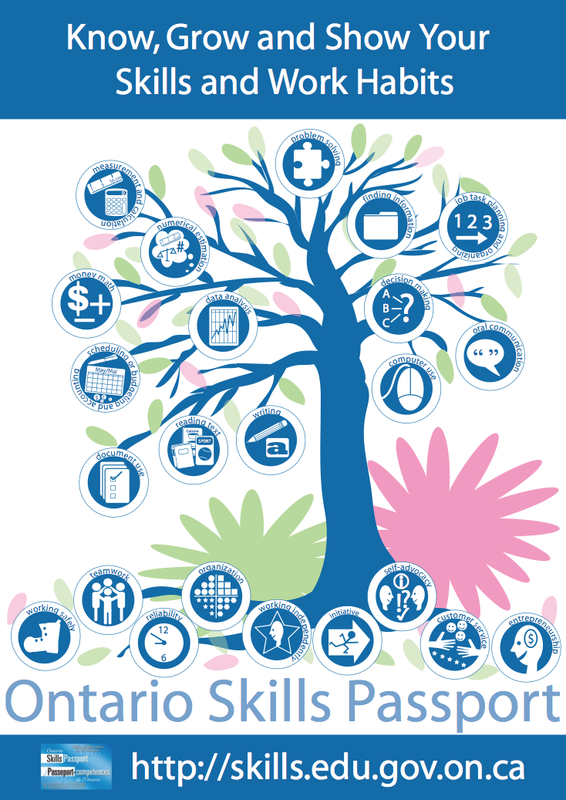 Job Task Planning and Organizing: The planning and organization of one’s own work. Decision Making: The making of any type of decision, using appropriate information. Problem Solving: The identification and solving of problems. Finding Information: The use of a variety of sources, including written text, people, computerized databases, and information systems. There is an extensive web-site with case studies, tool kits and resources linked to occupations and tasks. 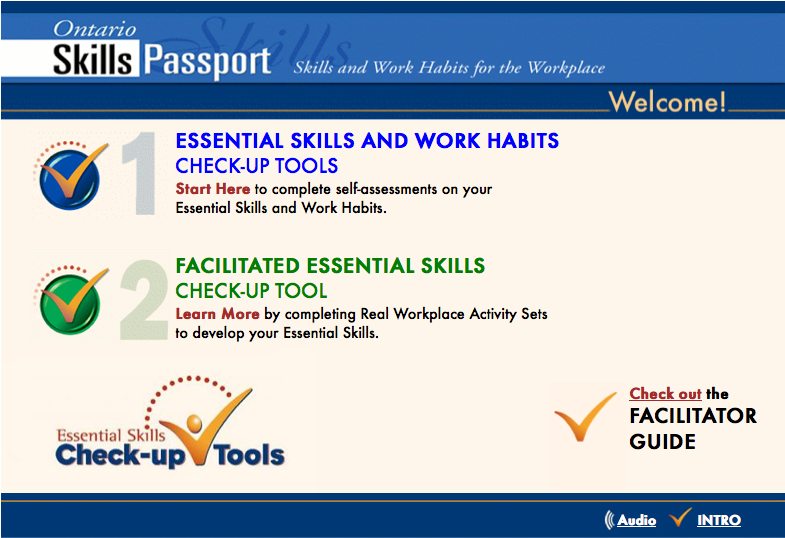 The passport is structured to support workplace learning, learning in school and college and lifelong learning with a database that contains sample workplace tasks for 390 occupations, grouped by essential skill and skill level. also love the theme/design), I don't have time to read it all at the moment but I have saved it and also added in your RSS feeds, so when I have time I will be back to read a great deal more, Please do keep up the great job.